Successful product marketing is looking at products and services from the customer or user’s point of view. User-centered design optimizes products for how users need to use them, rather than forcing users to change their behavior to use a product. An important variable that we can use to differentiate between users is gender. Research has provided evidence that there are inherited differences between the cognitive style of men and women -- in other words, the way men and women think, perceive and remember information. According to Simon Baron-Cohen, a professor of developmental psychopathology at the University of Cambridge, there are observable differences between how boys and girls behave at birth. While most female babies give most of their attention to social stimuli such as human faces and voices, the majority of boys pay most attention to non-social, spatial stimuli, such as the movement of a mobile hanging above a crib. Throughout their lives, male and female individuals continue to manifest these early traits in more and more complex ways. A growing body of evidence suggests that males spontaneously systemize to a greater degree than females do, while females spontaneously empathize to a greater degree than males. Other studies have also suggested that mathematics, physics and engineering -- all of which require a high degree of systemization -- are more commonly male occupations, while women are better at decoding nonverbal communications, picking up subtle nuances from tone of voice or facial expressions or judging a person’s character. Obviously, this does not mean that all men are systemizers and all women are empathizers. In a Clicktale study, we analyzed the way men and women interact with different websites. The differences in behavior were observed repeatedly: The image below is taken from a recipe website. From the side-by-side mouse-click heat map presented here, you can see the percentage of website visitors who clicked on various parts of the page. Men are in the left-hand heat map while women are shown in the right-hand heat map. At first glance, it’s clear that many more women were engaged with the top menu bar -- clicking into the various categories to view the different recipes. 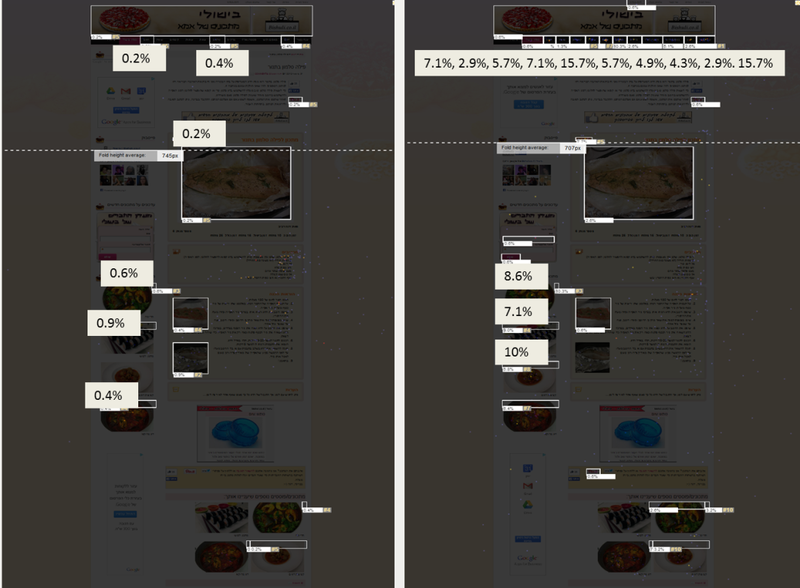 Also, women were more likely to click on the left-side icons rather than stay solely on the recipe. Men, on the other hand, tended to be far more limited in their clicks -- they search exactly for what they came for and then leave the site when they are done. 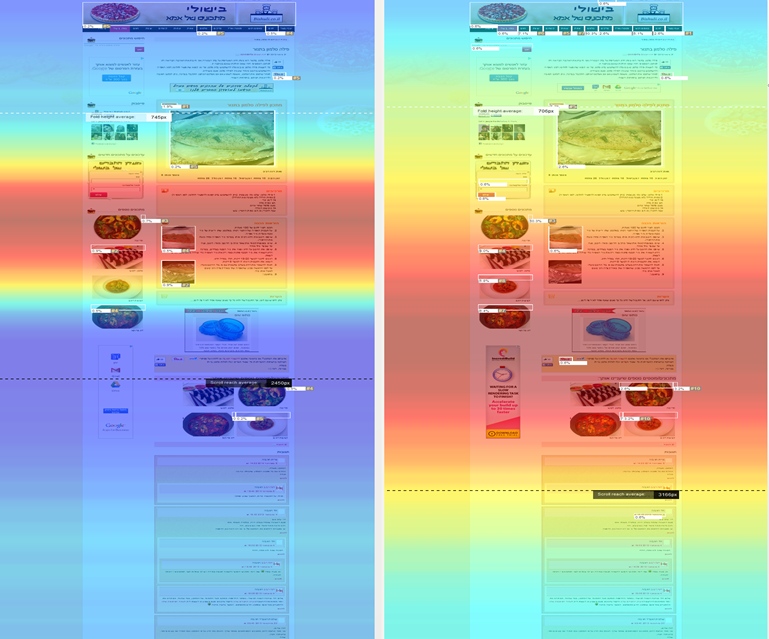 Below are the side-by-side attention-heat maps comparing men's attention on the web page (left) to women (right). and female attention on the page. As seen by the narrow "hot" band in the center of the page, men were focused on the ingredients of a recipe and how to prepare it. Women, on the other hand, browsed up and down the page more and were less focused -- as seen by the wider, more diffused "hot" band. Both heat maps confirm that men were far more systematic in their behavior on the site while women fit the empathizing cognitive style far more. The implications for website design. Gender differences impact many aspects of life, including shopping behavior. A study titled “Men Buy, Women Shop” revealed significant differences between the shopping behaviors of men and women. According to Wharton marketing professor Stephen J. Hoch, “Women think of shopping in an interpersonal, human fashion, and men treat it as more instrumental. It’s a job to get done.” He adds that this data has implications for businesses that are interested in developing a more segmented approach to building and maintaining loyalty among male and female customers. The study found that women are more focused on the experience, men on the mission. Women react more strongly than men to personal interactions with sales associates, while men are more likely to respond to the more utilitarian aspects of the experience, such as the availability of parking, whether the item they need is in stock and the length of the checkout line. Reasons to go online: Men are more oriented toward impersonal or individualistic goals. Women are more oriented toward social integration. While women enjoy the browsing process, men are more task-oriented and focus on how well they are able to accomplish a task and find what they are looking for. Website type: Women focus on socializing and communication and spend more time doing social networking and writing email messages. Men care more about functionality and are more likely to use a website as a tool -- for example, to check the weather, read the news and financial information or download software. Attention: Women are much more concerned about online security. They tend to need more information to make a decision -- which ties in with the results of the ClickTale analysis that shows women read more pages than men -- prefer different colors, read more ad copy, read stories in detail and care more about bargains. Men, on the other hand, tend to be more impulsive shoppers, prefer headlines and bullet points and are less concerned about shipping costs than women. Segmenting by gender is crucial if businesses are to make their websites more enjoyable, empower their visitors, and ultimately, increase their revenues. This does not mean, however, that gender-based segmentation should lead to websites that are only for women or men. But careful attention must be paid to the gender demographics of web visitors to avoid designing websites that don’t cater to the dominant gender visitor.